Gift Certificates are available and make a great gift. Please call us if you'd like to purchase by number of nights instead of by dollar value. 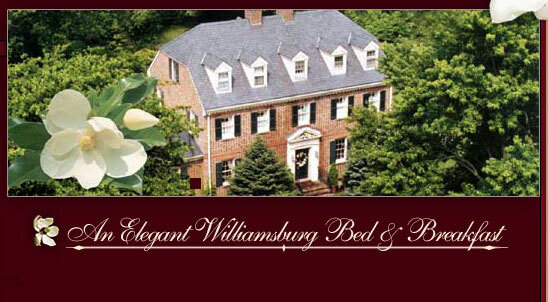 Magnolia Manor is an elegant bed and breakfast located in the historic area of Colonial Williamsburg, Virginia. It is a scenic four block walk to Colonial Williamsburg and one block from the College of William and Mary. The building is a historical colonial revival with a spacious parking lot. We invite you to stay at Magnolia Manor and experience Colonial Williamsburg history and hospitality. 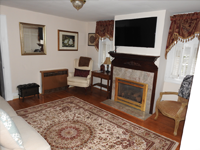 Each morning at our bed and breakfast begins with a breakfast in the lovely dining room by the fireplace. Complimentary refreshments are available throughout the day at our Williamsburg Bed and Breakfast.